Here at Play the Past we talk a good bit about history in games and teaching history with games. Today I am excited to put up a post that moves us a bit further in the direction of thinking about history of games and draw some attention to a neat project on Kickstarter. In business since at least the 1950s Chinatown Fair an old school arcade, closed its doors forever a few months ago. Kurt Vincent is working on a film documenting the final week of the arcade and the owners former manager’s launch of a new arcade in Brooklyn. I was excited to be able to chat with him about the project. Before getting to the interview here is a bit of background on Kurt’s ideas behind the project. I was initially drawn to Chinatown Fair because it seemed so out of place. It was as if it should not have existed at all. I had read about the arcade in the NY Times and was amazed as soon as I walked through the front door. It was a different world inside, full of energy and warmth. When I discovered the community that surrounded the arcade I knew I wanted to make a documentary that would capture the feeling of being there and share the incredible stories and history I was discovering. What drew you to the Arcade? In your description of the project you noted that “it seemed so out of place” and that when you entered “it was a different world inside, full of energy and warmth.” Could you tell us a bit more about that? When I moved to New York from Columbus, Ohio three years ago I was excited to find an old school arcade. I had a vision of an arcade, based partly on nostalgia and partly on a romanticized image from movies, that if it existed it was in New York. The first time I went to CF it was a Friday night. Friday nights at CF were famous. That was when people from all over the five boroughs would come. When I walked in the familiar hot electronics smell hit me and reminded me of going to the arcade at my local mall as a child. It was crowded,hot and sweaty, and surprisingly loud. To be heard you had to shout. And you used tokens. No plastic cards. It was exactly the vision I had in my mind. 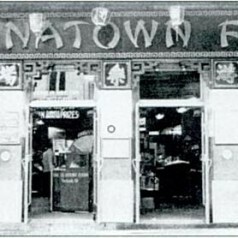 Do you have a sense of the history of Chinatown Fair? To what extent do you think this history is the the same or different from history of Arcades across the country? Chinatown Fair shares only general details that are somewhat universal to arcades across the country, e.g., the loss of business caused by home consoles and other ups-and-downs related to trends in gaming culture like the spike in the late ‘90’s from the of music games (the DDR craze). Beyond the industry wide trends, Chinatown Fair’s history diverges and is full of unusual facts that are unique to CF. I credit this singularity to its geography, which I believe is the reason it survived for as long as it did even while every other arcade in NYC closed. I am still learning the history and to be honest I only know the basics. A respected Chinese American war-veteran, George Gee, ran the arcade throughout the 1940’s and 1950’s when it was actually located across the street from where it later stood and included a museum of artifacts from China to attract tourists as well as a penny arcade featuring early coin-operated games. I was told by Henry Cen, the former manager of CF who grew up across the street, that the contents of the museum were sold to the Museum of Chinese in America in the 1980’s. Though I haven’t checked that with MOCA. Fast forward to the ‘80’s, Chinatown was rapidly expanding with an influx of Fujianese immigrants and becoming an area of high crime. It was a dangerous neighborhood that was sort of ignored by outsiders. At least that is what I have gathered. There was a serious gang presence and I have been told by a few people that The Flying Dragons and The White Eagles, two powerful gangs, had hangouts nearby Mott Street. Chung Ng, who grew up two blocks from CF in the 1980’s, told me that his parents forbid him from going to CF when he was young because teenage gang members were always around smoking cigarettes and using the arcade as a recruiting ground, yet that didn’t stop him from sneaking in to play Double Dragons and Contra. At this time you would have heard Chinese dialects being spoken more than English. During the Giuliani era Chinatown became a lot safer and I think this is when kids from the Lower East Side that weren’t Chinese started showing up. You talk a fair amount about the community that existed in and around the Arcade. What do you think the loss of arcades like Chinatown Fair says about changes and continuities in games culture? The loss of arcades like CF shows me that games culture is connected to the technology the games utilize and the economy of that technology. For a longtime to play the best and newest games against the best players you had to go to an arcade. Now with home consoles with online capability you have the power of an arcade in your living room. By this theory though, arcades would have become obsolete years ago. The x-factor that has kept arcades relevant is the value of real life social interaction. Being with your friends, competing against them in person, will always serve an important function. And that is why CF stayed relevant for so long. It was where you came to show off your skills, to improve, and to earn respect. If you only played online and didn’t show up to play against the best at CF you were not really a part of the scene. Is there going to be a significant historical component to your film? From your interactions with regular visitors do you have any sense of big changes to the arcade and it’s community over time? There will be a historical aspect though I am unsure of how significant a part of the movie it will be. I have some ideas about incorporating archival footage and exploring the use of animation as a story telling device. If I can get the funding for this it could really be interesting. A random side note, Charles Bao, who backed the movie on Kickstarter and works in Chinatown, told a few guys at work about the movie who in turn told someone they had just met at a local bar about the movie. The guy told them he has a close friend that shot a bunch of black and white super-8 film at Chinatown Fair in the 1960’s. I love random connections like that and look forward to seeing that footage. In regards to changes in the community, I have found that it has indeed changed a lot. The community consists of various crews associated with specific games. On the macro level you have fighting gamers, music gamers, puzzle gamers, racers, and shooters. Within the fighting gamers, you have the Street Fighter 4 crew, Marvel crew, and Street Fighter 3rd Strike crew, among others. Of course you have cross over, a lot of the 3rd strike players also play SF4 and you have some fighters that also play music games, but the division of crews based on the type of game and furthermore, the specific game are definitely apparent. I was surprised by the fact that there was tension between the groups on a macro level. I found that a lot of the fighters looked down upon other types of gamers, especially the music gamers, whom they associated with people that just hung out at the arcade and didn’t take gaming seriously. This reminded me of what I discovered in the surfing community, which I learned about while working on a previous documentary. There is a pretty big division between short boarders and long boarders in the surfing community. In the arcade it was the same thing just based on the type of game you played. I also found animosity towards the growing LGBT community that hung out at CF. This was not based on homophobia, but on the feeling that many of them came to primarily hang out rather than for competitive gaming. I am interested exploring the social aspect of the arcade and how it has changed through time so it will be a big part of the movie. How has working on this project changed your thinking about games and games culture? That is, were there any assumptions about what an arcade is or does that were challenged by your experience on the project? I was unaware that the arcade played such an integral role in the social lives of people that went there. I thought of arcades as a place to have fun with friends. While it certainly is that, what I have learned is that an arcade is much more than. I now define an arcade as being a home for competitive video gaming as well as entertainment. Under this definition Dave and Buster’s is not a true arcade. In your description of your work you say you are trying to “to preserve and share a special time and place unaffected and authentic in a way that you don’t see very often” could you tell us a bit more about this goal? Specifically, what it is you are trying to capture and preserve and what you mean by unaffected? I meant that the arcade was free of artificiality. It wasn’t created with a specific image in mind, or fabricated. Many places try to cheat you into feeling a certain experience. This is present throughout culture — fashion, architecture, music, and movies. When they do this they lack impact compared to whatever they are aping. For instance, I go to a diner that has stood in the same place longer than I’ve been alive and order a milk shake that is mixed with an old stainless steel Hamilton-Beach shake mixer that has mixed thousands of shakes before, that shake is going to taste better than the one I order at Johnny Rockets, even if it has the same exact ingredients. Maybe a lot of people won’t agree with me and that’s fine, both shakes are good, but for me that’s the way it is. From the first moment I discovered Chinatown Fair its history was apparent. Truly authentic places, that are a product of passion and history, are hard to find and it seems that many are disappearing. It doesn’t matter if they are beloved or historical, they are disappearing, and often unnecessarily. New York has been experiencing this trend for sometime now. The current recession doesn’t seem to be slowing it at all. Look at how Yankee Stadium was bulldozed and replaced with a fancy replica. And that was the house that Ruth built. It amazes me that Chinatown Fair survived as long as it did. It’s really a testament to the strength of its community and that it couldn’t have been located in a better place. The rent in Chinatown was stable for much longer than other areas in Manhattan (especially Times Square where a number of popular arcades went out of business) and it was easily accessible by subway. Also, NYC is so incredibly diverse that the arcade was naturally welcoming of all types. Returning to the question, it is my goal to preserve CF in the movie because it is historically significant and because people need to be aware that places like CF exist/existed. It’s important to tell the story because it represented a vibrant and passionate community that was colorblind and tolerant of all genders and sexualities. Places like that are rare anywhere. It is clear you have already garnered significant support for the project. Many of the bloggers on this site work inside academic institutions and seek grant funding to support their work, but I know we are all fascinated by the possibility of using things like kickstarter to fund and invite participation in our work from broader communities. What has your experience working with kickstarter been like? What guidance would you give to anyone interested in using kickstarter to support a project related to games and history? My experience with Kickstarter has been incredible. If I were to apply for grants I might have to wait months to find out if I am awarded money and I would be competing with many other equally deserving projects. Kickstarter is allowing me to directly connect with an audience that wants to support my vision. That is revolutionary and exemplifies the potential of the internet. There is no way I could raise money to make this movie from a production company or distribution company. That just doesn’t happen often and I certainly lack the necessary connections and experience to get that sort of funding. I have a vision and Kickstarter is enabling me to obtain the resources to do it. If you are interested in using Kickstarter to support a project related to games and history I would determine the absolute lowest amount of money required to complete the project. And then try to see if any similar projects raised money at that level. If you think it’s within reach then work on its presentation. If you have a good enough idea and your passion for it shows then I think people will want to support it. The tricky part is getting people to your project.